And here we go, here is what happens when a man cannot keep his commitments and places his own selfish ambitions above others – let alone above a pregnant wife (Ginny Barber). Ginny Barber is really quite a beautiful woman. She looks smart, strong, and I don’t know of course, but she is probably a good wife as well. But Tiki is consumed with himself and being led by his own selfish ambitions – period. 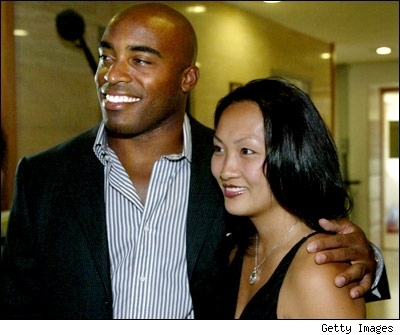 So the result is, of course, a divorce that will have large, sweeping implications far into the future for both him, Ginny, their children, and of course Tiki’s mistress as well. Hey Tiki. Think before you leap. Pray! Pray! Pray! Try to eat your EGO and reconcile with your wife. Man,,,,, maybe your wife has faults and maybe you do too. You are blessed with two boys and two more babies on the way. When you look into your kids’ eyes, you must see yourself. And a part time Dad leaves gaps in a kid’s heart that may never be fulfilled. Sometimes we all go through changes, and must find a new direction in our daily lives. Now, I bet that if you tried hard to win back you wife,,,,, you could, And I bet that your wife Ginny would forgive You and the both of you could rebuild your family. Family comes first. Your family will always be there for you if you are there for them. Make the Right play when it counts the most!!! 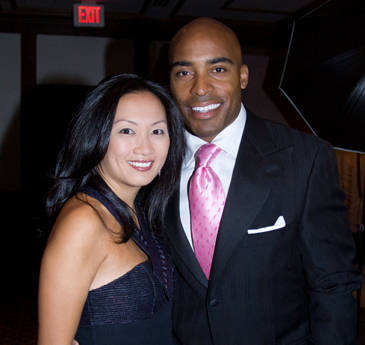 Tiki Barber's personal life should remain personal. It has nothing to do with you. Allow the fairytale being you call "God" to deal with his "improprieties" in the "afterlife".